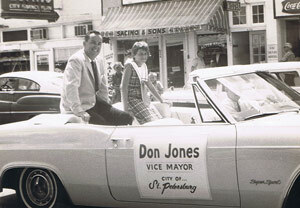 Don Jones was city councilman from 1963-1967 and mayor from 1967-1969. In a recent interview, he described his tenure as ‘the best of times and the worst of times.’ “Five of those years were years of dramatic progress, accomplishment and growth. The sixth year was a time of stress, tension and confrontation due to the racial climate at that time in St. Petersburg and America,” stated Jones. 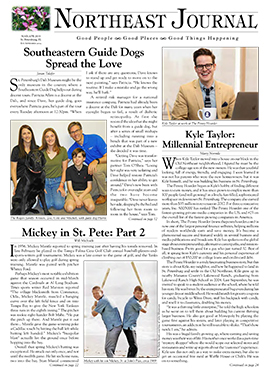 Don arrived in St. Petersburg from Geneva, New York, in 1956, and established his own insurance business. He also was an avid pilot and joined the local pilots association. He became active in community affairs. One of his first volunteer activities was to chair a fundraising drive for the March of Dimes. He came up with the novel idea of a ‘March of Dimes Airlift.’ The public was given plane rides by volunteer civilian pilots for a donation to the March of Dimes, based on their weight, at 10¢ a pound. The Airlift was highly successful and even received recognition from the national March of Dimes organization. Former Mayor Don Jones today. Note mayor’s desk name plate. About the same time as the March of Dimes drive, Don remembers that the local newspapers embarked on a campaign to close Albert Whitted Airport and convert it to public and civic use. He became one of the spokespersons for the pilots association to keep the airport open. He participated in a number of debates held at service clubs and neighborhood associations. Advocates for the airport prevailed. It was at this point that a friend who was a member of the city council urged him to run for a city council seat. After much discussion with family, friends, and business contacts, Don decided to declare his candidacy in December 1962. The election was to be held in March of 1963. When he decided to run for city council a mere seven years after arriving in the city from Geneva, New York, he was still regarded by many as a newcomer. He commenced his campaign, walking door-to-door throughout the council district. He says he “found out that politics is a lot of fun.” Don remembers one door he knocked on in particular. “On one day, by accident, I knocked on – the door of my opponent, G. Harris Graham. We were both surprised. He was not a ‘happy camper’ but I got through it OK.” Don eventually won the election with 55% of the vote. On February 25th, former Mayor Don Jones and his wife Mary were honored by the City on Don’s 90th birthday. Don and Mary are surrounded by Don’s peers: Mayor Rick Kriseman, Mayor Bill Foster, Mayor Rick Baker, Mayor David Fischer, and Mayor Bob Ulrich. 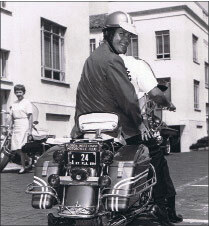 Mayor Don Jones on motor cycle, image 1967. Having successfully served on the city council, including service as vice mayor, Don was elected mayor on March 21, 1967. A look at Don’s campaign literature for that election shows themes such as ‘Progressive in Human Relations’ and ‘Receptive and Responsive to All People.’ Upon election, he immediately announced three goals: Operation Greenspot the spin-off of Mound Park Hospital from city operation, and adequate wages for city employees. Operation Greenspot was a program to clean up and create small grassed parks out of vacant lots in the city’s rundown neighborhoods. “At that time, the city was totally segregated, including public facilities. A black police officer could not arrest a white man. Our parks and recreation department was segregated. Black children could not play with white children in a recreation center.” One early action to come before the council was a proposal by the city manager to fence in Lake Maggoire and charge for admission to discourage its use by African Americans. The measure was approved by the council. Don’s was the only dissenting vote. A similar proposal was made to erect a fence at North Shore Beach, and again Don vigorously opposed the measure. He fought virtually alone for the John Knox Apartments for the elderly located in a black neighborhood, and for an outreach employment office on 22nd Avenue South. 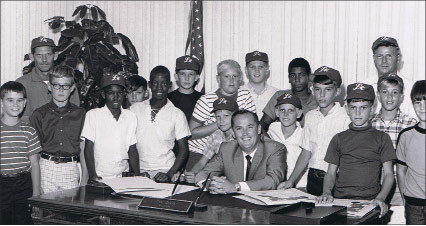 Mayor Don Jones with youth group, circa 1967. 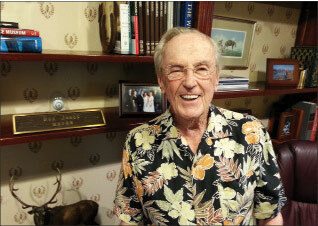 Don celebrated his 90th Birthday on February 23rd. 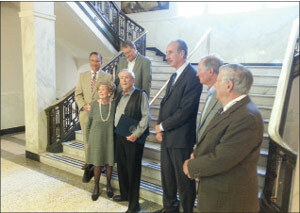 A special celebration was held at City Hall with all living former mayors attending. Sources: Evening Independent, various but especially 5/9/68, 5/18/68, 7/18/68, 8/17/68; Peyton L. Jones, “Struggle in the Sunshine City: The Movement for Racial Equality in St. Petersburg, FL, 1955-1968,” thesis, University of South Florida; Will Michaels, The Making of St. Petersburg (2012/2015); Darryl Paulson and Janet Stiff, “An Empty Victory: The St. Petersburg Sanitation Strike, 1968,” Florida Historical Quarterly; John Howard McNeilly, The St. Petersburg Sanitation Strike of 1968: A Process in Political Empowerment; Evelyn Newman Phillips, “An Ethnohistorical Analysis of the Political Economy of Ethnicity Among African Americans in St. Petersburg, Florida, dissertation, University of South Florida; St. Petersburg Times, various but especially 3/20/63,1/12 /69, 5/10/68, 6/7/68, 7/14/68, 8/1/68/ 8/10/68; The Sarasota Journal 5/14/68; and interview with Don Jones. I’m happy to pass this information along to Will Michaels, the writer of the article. Thank you for contacting us. Happy Holidays!